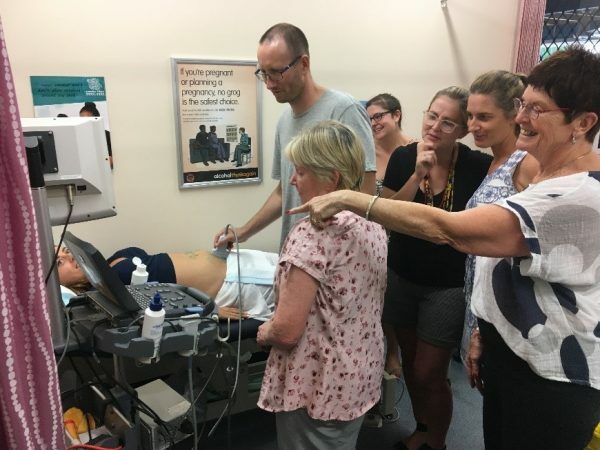 ASUM was pleased to be approached to assist the Kimberley Aboriginal Medical Service (KAMS) to organise an outreach ultrasound workshop for North West WA. 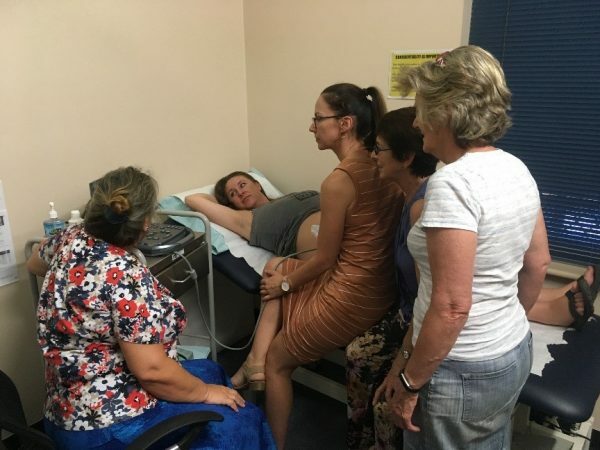 KAMS were keen to run a workshop aimed at their medical practitioners and midwives in basic obstetric scanning. The Kimberley is WA’s most northern region and forms one sixth of WA’s land mass. It is twice the size of Victoria and three times the size of the United Kingdom. The two largest towns in the Kimberley – Broome and Kununurra – are respectively 2231 km and 3205 km from Perth. There are more than 100 Aboriginal communities in the region. The Kimberley is a unique demographic set that includes around 44% Aboriginal people and a young workforce that is aiming to capitalise on regional opportunities. The Kimberley has a population of approximately 39 620 (approximately 17430 Aborigines) (2016). KAMS takes pride in that it is an organisation of Aboriginal people controlled by Aboriginal people for Aboriginal people. KAMS is made up of a number of members – Beagle Bay Health Service, Bidyadanga Aboriginal community, Broome Regional Aboriginal Medical Service (BRAMS), Derby Aboriginal Health Service (DAHS), Nirrumbuk Aboriginal Corporation (Broome), Ord Valley Aboriginal Health Service (OVAS – Kununurra); Balgo, Mulan and Bililluna Health Services, Kutjungka Clinical Services and Yura Yungi Medical Service (YYMS). There is a large body of evidence to demonstrate that Aboriginal women experience poorer maternal health outcomes, higher rates of peri natal and infant mortality, and deliver babies with lower average birth weights when compared to non-Aboriginal women (www.wacountryhealth.kimberleyhealthprofile2018). Around 700 births per year occur in the Kimberley. ASUM Outreach volunteer tutors with KAMS doctors and midwives who attended the course. KAMS was able to organise for 11 staff members to attend the ASUM Outreach Workshop. The workshop was led by Dr Sue Campbell Westerway, and assisted by Rae Roberts, Marilyn Zelesco and Steve Abbott. Sue has been involved in running international outreach programs for many years with attendees being very interested in her international work. 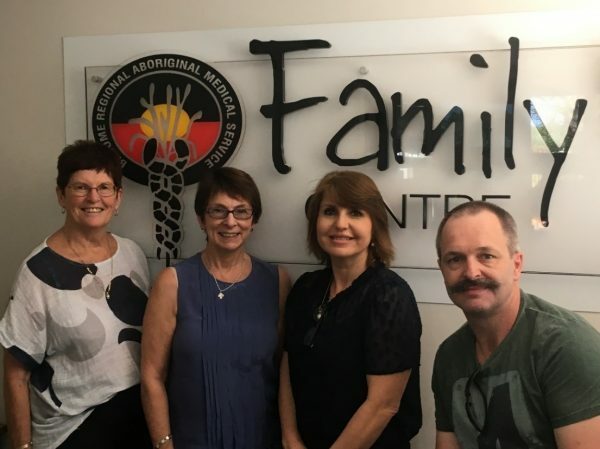 Both Rae Roberts and Marilyn Zelesco have conducted past rural education events and Steve Abbott is the current WA Country Health Service Tutor Sonographer. All delivered theory lectures and ran a practical scanning station. Three of the practical stations were patient scanning stations, while one was an obstetric phantom station. The phantom belonged to Royal Perth Hospital and was generously loaned to the project. 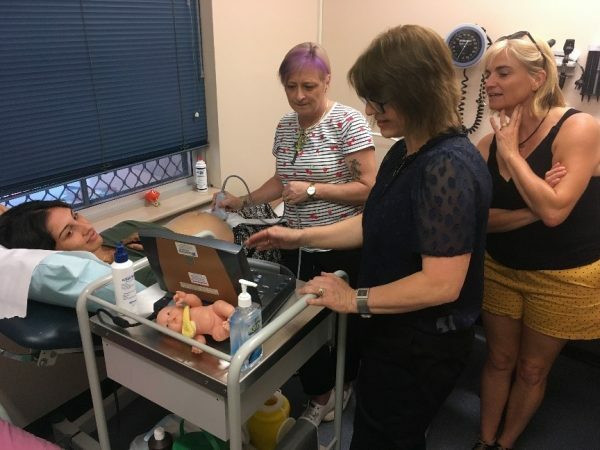 Attendees enjoyed the opportunity to scan an “immobile fetal phantom” to develop hand-eye co-ordination and consolidate fetal lie and placentation principles in transverse and longitudinal planes. The workshop covered 2 full days of didactic presentations – mornings were theory lectures at the KAMS office, with practical scanning in the afternoon at the BRAMS office. Topics covered included basic physics, early pregnancy scanning, basic fetal anatomy and placentation, measuring the fetus, identifying the multiple pregnancy and the third trimester well being scan. The lectures were developed to meet the learning objectives of the Certificate in Allied Health Performed Ultrasound (CAHPU) and the Certificate in Clinician Performed Ultrasound (CCPU). The pregnancies scanned during the hands-on session varied from early gestations of 6 weeks, through to advanced gestations of 35 weeks. BRAMS was also able to secure 2 patients with twin gestations. On completion of the workshop, the instructors organised to meet with staff of the Broome Regional Hospital Radiology department. Chief MIT – Duncan Thorne and Senior Sonographer – Jo King were able to meet to discuss ongoing support for the attendees of the workshop. All those undertaking the CAHPU or the CCPU are required to maintain a log book and perform supervised scans. The staff at Broome Regional Hospital have generously agreed to provide local support where appropriate and this will be an excellent outcome for the attendees.